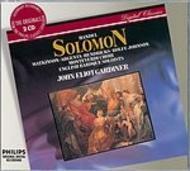 Gardiner�s Solomon is among the very finest of all Handel oratorio recordings. With panache, he shows how authentic-sized forces can convey Handelian grandeur even with clean-focused textures and fast speeds. ... The Act III scenes between Solomon and the Queen of Sheba are given extra warmth by having in the latter role a singer who is sensuous in tone, Barbara Hendricks. Carolyn Watkinson�s pure mezzo is very apt for Solomon himself, while Nancy Argenta is clear and sweet as his Queen; but the overriding glory of the set is the radiant singing of Gardiner�s Monteverdi Choir.